b). 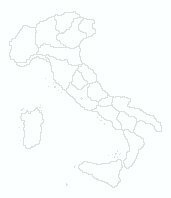 a fixed Amateur station in al least 75 italian provinces (for italian Amateurs). The same station may be worked twice or more, if in different provinces. Endorsements are available for Phone, CW, Mixed and RTTY contacts. Prefixes / Call area and italian provinces abbreviations. Call-area / Province name with its bolded and capitalized initial. Contacts before January first 1993 with the cities marcked (1), (2), (3), (4), (5), and (6)count for the old WAIP and for the following provinces VerCelli, COmo, MIlano, FOrlì, FIrenze, CatanZaro respectively. Cards have to be included, together with SASE, unless you can obtain a certification by IARU Society Award Manager. The award fee is 5 $ USA, or 3 £, or 10 DM, or 10 IRC, including registered mail shipment.